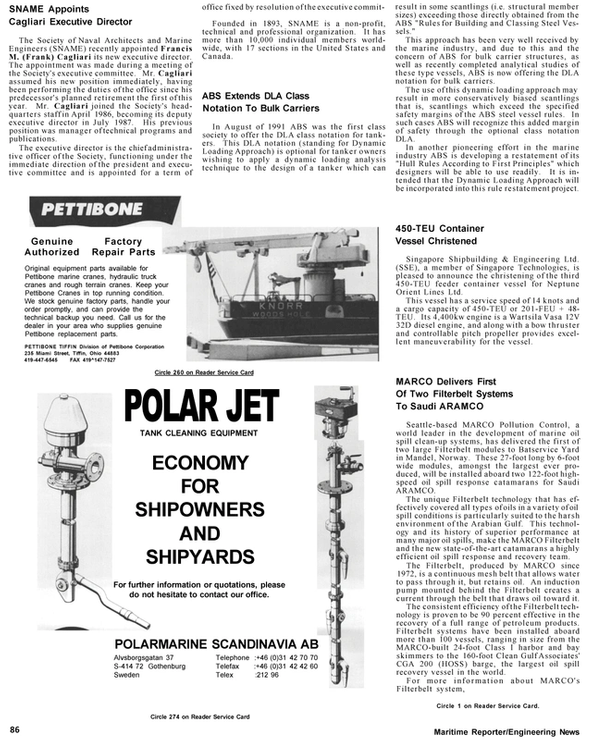 The Institute of Marine Engineers in association with the Royal Institution of Naval Architects is organizing and sponsoring an international conference in London, May 20-21, 1992. The theme of the conference is "Offshore Safety: Protection of Life and the Environment." As the impact of the Piper Alpha disaster and the Cullen report spreads through the industry some of the offshore safety questions still remain unanswered and many more have arisen. The development of a new regulatory regime requires a period of adjustment and there must be continuing review and monitoring to ensure that safety is being improved. This conference follows the very successful 1991 Offshore Operations Post Piper Alpha conference and will provide an opportunity for delegates to reappraise the situation in light of the developments that have taken place in the offshore industry. For further information contact Rhian Button, Conference Organizer, The Institute of Marine Engineers, The Memorial Building, 76 Mark Lane, London EC3R 7 JN. Tel: 071 481 8493. Fax: 071 488 1854.